Where has NASCAR's TV audience gone? What’s going on with NASCAR’s TV audience? Over the past three weeks, according to weekly Nielsen Media Research numbers, NASCAR has lost an average of a fourth of its viewing audience from one year ago at the start of the Chase. Ratings for the Chase for the Sprint Cup opener at New Hampshire were off 28 percent. Dover was off 23 percent and figures from Sunday’s race at Kansas show a 28 percent drop from one year ago. Folks, those are huge numbers. Even worse is the fact it’s developing into a very disturbing pattern. Don’t get me wrong, it’s no secret TV ratings have been flat or down slightly most of this season, but there’s something more going on here when such a precipitous drop coincides with what is supposed to be the biggest part of your season – the crowning of the Cup series champion. I don’t for one minute believe the big drops beginning with the Chase is mere coincidence. So what is it? -It’s because the races are on ESPN this year instead of ABC. That seems plausible to me except that an ESPN executive dismissed that reason in an interview last week discussing the ratings drop. -It’s because the races are running up against the NFL. Well, maybe if that was new. But races and football have run side-by-side for nearly 60 years now. -It’s the new 1 p.m. start time for most races. Well, that might make sense, except that NASCAR and its networks made the change to the earlier start times because “fans asked for it.” Did they all suddenly change their mind? Or could it be the elephant in the room – the Chase. Perhaps fans who took a look at it when it debuted in 2004 have soured on it. Perhaps those who didn’t like it to begin with, simply aren’t watching or not caring. 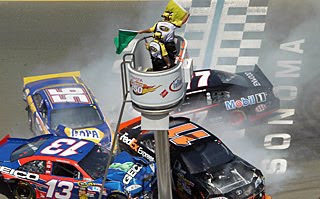 But I can tell you this: Everyone in NASCAR – not just executives – but everyone who has a stake in the sport best hope someone can find out why this is going on and attempt to fix it fast. It’s not a trend that is going to help the sport and especially if it gets any worse.